Food excites me. New food or new ways of doing things with food excite me even more. Therefore, for this month, I have set myself to go on another gastronomic adventure. Food discoveries await as I shuffled from stall to stall with a pop and lively background music. So for my food page [Kiss Your Cravings] highlight this month, The Weekend Market: Taste of the Nation was the way to go. The Taste of the Nation is another leg of Manic Nightnings Productions’ The Weekend Market, happening every third weekend of each month. 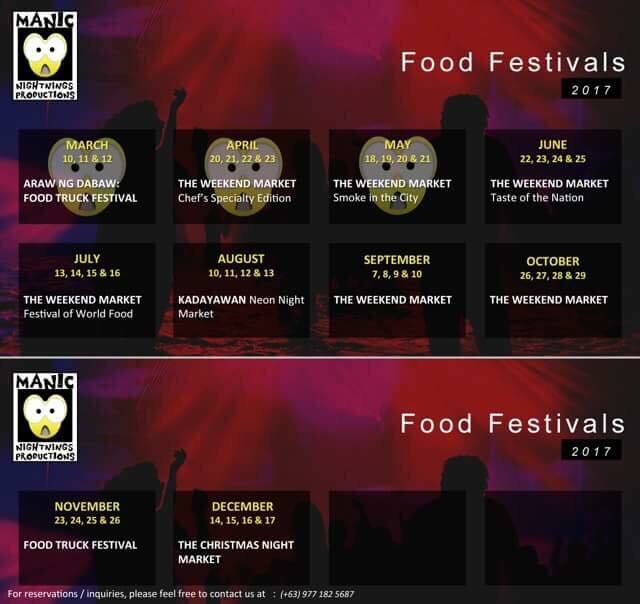 The event is an opportunity for every Davaoeño to try signature dishes from some of Davao’s most exciting restaurants and cafes in a beautiful outdoor food festival setting surrounded by pop-up food stands, dessert stalls and drink corners. All the way from Digos City, Davao del Sur, Southwing Cafeteria invades Davao City with its glorious chicken wings. They’re just a small resto in Rizal Street, Digos City but is out to make a big name in the recent The Weekend Market: Taste of the Nation. They solely served fried chicken wing dishes with different flavors and it’s the best I had, not to mention they serve lemonades too. The wings here are plump, succulent and come in your choice of Original, Barbeque Glazed, Sweet and Spicy, Pepper Lemon, Blazin Hot, and Soy Garlic flavors. I can no longer remember but I think I ate three sets on my first seating, visited the next day and ate another four sets of it – my favorite is the Pepper Lemon and Blazin Hot. Who doesn’t love seafood? RD Crab Shack is the best and the most convenient place for it. They’re amazingly affordable and their food is to die for. It’s actually my first time to try them and I can’t still move on from how tasteful the crabs and shrimps were. Fresh from the farm, they serve it just the way you want it. Spot their physical restaurant at Prime Square Compound at Torres Street because I heard buffet service is for P499 only. Will surely visit them real soon I can, as I am excited to crack shells and have taste their delectable crabmeat. Tita Rosita’s lemonades have been Davao’s favorite refreshment and at every food festival in the metro, they’re the only stall of its category that has a seriously long queue, but always worth the wait. My first sip of Tita Rosita’s lemonades was way back 2015 during a SMART event at Davao convention and since then, I’ve been hooked. Their Green Apple was a superstar flavour for me until I tasted Pink Pomelo, which is now my first love. Unbelievably, during the recent The Weekend Market: Taste of the Nation; I finished a total of eleven cups of Tita Rosita’s lemonades because apart from being affordable and being the blockbuster, their drinks are truly refreshing and thirst-quenching. I’m not really sure whether they have a physical resto here in Davao, nonetheless, each piece of Wagyu beef does taste gloriously delicious. Even though I only managed to eat two sticks of it, that was already good enough to satisfy my cravings – and I was already a bit full when I hopped on their stall. Wagyu is delightfully worth drooling over, basic but tasty and after the first bite of this tender, melting meat, you will be taken to another level of contentment. It’s a bit pricey though but nevertheless, it’s worth every peso. Pulling it off best, Pulled Bros is benchmarking a new way of serving sandwiches. Pulling off the meat and shredding it over the bread seem like a clever creation of God, as it does taste like you are in heaven. Moreover, it comes in different sauces of your choice. All their sandwiches are simply lip smacking, tasty and a spot-on delectable bedding of fries. Though the fries are a bit bland, it does not take away anything from the taste as a whole. Satisfyingly good that I highly recommend their must try Pulled Pork Barbecue Sandwich. Yummy! There are a total of 65 restos and cafes, which joined forces to make The Weekend Market: Taste of the Nation a success. Although I was not able to try them all, I am very sure that having tasted about 80% of the offerings, these five above have been simply exceptional for me. So what’s your favorite? The festival is regularly held at the Parking Lot C of SM Lanang Premier, Davao City. For real time updates, do visit Manic Nightnings Productions’ Facebook page here or check out this photo below for the next following months’ schedules. The Weekend Market: Taste of the Nation is where we meet to enjoy and explore various authentic food experiences that each one should try. So for all Davaoeños, we need to celebrate them, support them, consume them and make them ours. We need to appreciate them, as they are truly a taste of the nation.